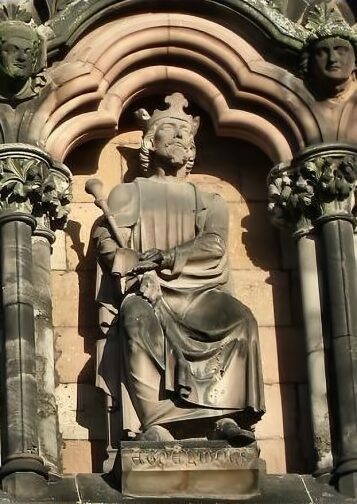 Egbert, first king of the English was succeeded by his son Ethelwulf, who had previously been sub-king in Kent. Kent was then assigned in turn to Ethelwulf's eldest son, Athelstan. Ethelwulf, the name means noble wolf, is described by chroniclers as being a heavily built man, who was inclined to be sluggish and indolent. Of a gentle and pious nature, he had expressed a desire to be a priest when he was young, his warlike father was said to have found his pacific eldest son a disappointment. He was aided in government by St. Swithin, Bishop of Winchester, at the time a senior statesman but now chiefly remembered as the patron saint of rainy weather. The new King was crowned at Kingston-upon-Thames in 839. He consolidated the power of Wessex and re-asserted the supremacy over The Kingdom of Mercia. An alliance was formed by marrying his daughter to the Mercian King, which was to prove of lasting value to the House of Wessex. Much of Ethelwulf's reign was spent combating the invading Vikings, whom he struggled to contain. They sailed repeatedly up the Thames and pillaged London and the towns of Rochester and Canterbury. A congress was held at Kingsbury in Oxfordshire, to encourage co-operation with the Mercians in repelling the mutual enemy, to which Ethelwulf sent his father-in-law, Osric, as his ambassador. King Burghred of Mercia advanced courageously against the Vikings but was defeated. Ethelwulf, along with his son, Ethelbald, met and defeated them in battle in 851 at Achleah, possibly Oakley in Surrey, where according to the Anglo-Saxon Chronicle he inflicted 'the greatest slaughter of a heathen army that was ever heard of to this present day'. Thereby Ethelwulf obtained temporary security for his kingdom. Ethelwulf was married firstly to Osburh, the daughter of Oslac of Hampshire, a Jute. Originating from the Isle of Wight, Oslac was purported to have been able to trace his line back to Jarl Hengist, one of the leaders of the first Saxon armies to invade England. As well as being learned, Osburh held the reputation of being a highly pious woman and was much respected by the people. The couple had much in common, their children were to be brought up with a deep reverence for religion. Osburh produced five sons, four of whom were to reign in turn, after their father. She died around 850. The highly religious Ethelwulf undertook a pilgrimage to Rome, acompanied by his youngest and best loved son, Alfred. On the way back he formed an alliance with Charles the Bald, King of the Franks, taking in marriage his daughter Judith, who was descended from Charlemagne. The pair were married at Verberie sur Oise on 1 October, 856 and the new Queen of Wessex was solemnly crowned by the Bishop of Rheims. In Ethelwulf's absence, his eldest surviving son Ethelbald, who strongly suspected that his father wished to make his favourite son, Alfred, heir to Wessex, had taken advantage of the discontent of his subjects and usurped the throne. The practice of recognising the successor as co-king was an established practice among Germanic tribes. Although he retained some support, to avoid bloodshed and civil dissension, Ethelwulf nobly accepted the status quo and reverted to his former position as sub-king of Kent. During the remaining two years of his life, he did much to alleviate the sufferings of the poor in Kent. His care continued after his death, for he left provisions in his will for his successors to provide food, drink and lodging for one poor man per tenth hide of cultivated land in the kingdom. King Ethelwulf died in 858, much mourned by his people, few monarchs have had such an epitaph. 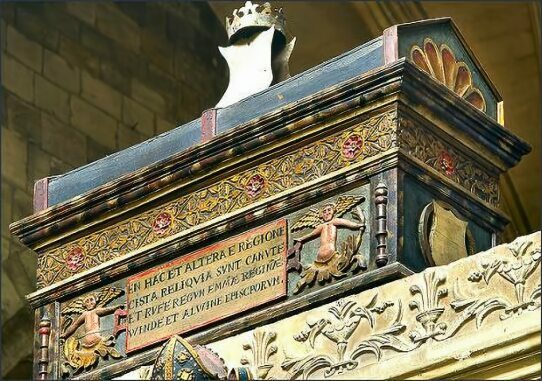 He was buried at Steyning, but his body was later moved to Winchester Cathedral. 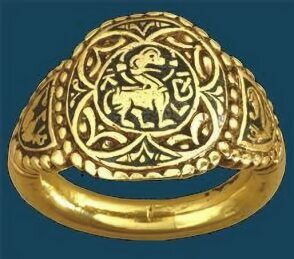 An enameled gold finger ring, manufactured for Ethelwulf, was found in a cart rut at Laverstock in Wiltshire, in the summer of 1780. It was probably used as a symbol of office bestowed on faithful retainer, as was the practice at the time. 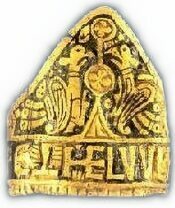 The ring measures around an inch across, the flat hoop rises in front in the form of a high mitre-shaped bezel and is richly decorated with religious symbols, and inscribed ' Æthelwulf Rex'. The central design on the ring represents the Christian symbol of two confronted peacocks flanking the Tree of Life. Another ring belonging to Ethelwulf's daughter, Ethelswith, was ploughed up in a field between Aberford and Sherburn in the West Riding of Yorkshire in 1870. It was said to have been attached by the farmer who found it to the collar of his dog but was later purchased by a York jeweller. Ethelswith was was born circa 846 of Wantage, Berkshire, she married to King Burgred of Mercia in 853 or 854 and died at Pavia while on pilgrimage to Rome in 888. The ring, which is about 26 mm in diameter, has a circular bezel, inlaid with niello, with an image of the Lamb of God and the letters A and D (Agnus Dei, or Lamb of God). Engraved on the back are the words 'Eadelsvid Regina'. In common with the Ethelwulf ring, it signifies a royal gift or symbol of office, not a royal possession. Both rings are now on display at the British Museum.